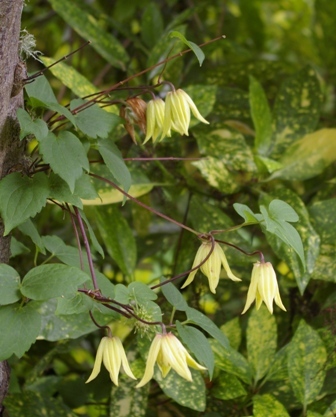 Joy Creek Photo Archive (c) all rights reserved Clematis chiisanensis 'Lemon Bells' is a charming selection by the University of British Columbia. Soft yellow bell-shaped flowers have very thick sepals that are red at their bases. The stems are dark purple with bright green foliage. This will repeat on new wood in the summer. All of our Clematis are two year old plants that are suitable for immediate planting in your garden. This is a Great Plant Pick. The atragene forms have lantern-shaped flowers from April through May. Their silky seed heads are attractive throughout the season. These bloom on old wood. Prune or tidy up after bloom or cut back hard soon after bloom to revitalize.